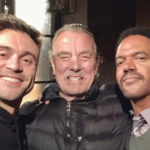 The Young and the Restless spoilers indicate that Victor Newman’s (Eric Braeden) life is about to get plenty messy as Sharon Newman (Sharon Case) is put in a conundrum that implicates her family, but that Christine is also out for blood, too. To complicate matters even more, Michael tells his client that things won’t end very well for him. Clearly, Victor didn’t expect that things would end up so badly like this! It all began when Sharon received some damning evidence against Victor when someone mysteriously sent her an audio clip of the Newman family patriarch supposedly talking about his murder plans. Needless to say, Sharon was shocked when she received the email attachment. Knowing that she couldn’t tamper with the evidence, she told Nick Newman (Joshua Morrow) about it, which in turn made him very nervous about his family’s future. Sharon knew that she had two options: she could either submit the audio clip to authorities or ignore it, knowing all too well that Victor didn’t kill J.T. Hellstrom (Thad Luckinbill). After all, she along with Nikki, Victoria and Phyllis have been hiding their little secret about JT’s dead body for months now. But at the same time, submitting the tape would help clear her name from any suspicion or better yet, wrong doing. Sharon went ahead and submitted the tape. Unfortunately, there’s not much that Victor can do other than to claim that someone is out there seeking revenge on him and his family. Michael says that unless there’s a reasonable cover story, Victor might be spending the rest of his golden years behind bars for a crime that he knows he didn’t commit. Either way, the future definitely doesn’t look promising for him, especially with the “eagle legal” on his tail, so to speak. Of course, fans will have to tune in to find out what will happen next! The Young and the Restless airs weekdays on the CBS network. Check your local listings for times. As always, drop us a line with your thoughts below. And don’t forget to check back with The Young and the Restless and all of your favorite daytime television shows right here!